If you follow my channel, you may have picked up on my borderline obsession with jackfruit over the past half year or so. Luckily Trader Joe's started stocking the stuff shortly after I fell in love with it (thank you universe! ), so now I can shamelessly hoard cans of it more easily. BBQ jackfruit is one of my favorite ways to prepare it. It's super easy, requiring just a few spices, your favorite barbecue sauce and a little bit of patience. I prefer cooking it in two steps: simmer it gently with the spices until it's tender and easy to mash or shred, then bake it with sauce to lock in the flavors and add a slight chew to it. Some recipes will recommend that you cut out the center pieces of the jackfruit and/or remove the seeds because of their toughness. I haven't found this to be necessary; they soften up nicely when simmered, and provide a nice textural contrast to the more tender pieces. Plus, the jackfruit shrinks somewhat when baked, so it's a shame to waste part of it. This recipe is just a basic outline – go crazy with your favorite spice blends and sauces! And there are so many ways to serve this stuff: in sliders with tangy coleslaw, on vegan nachos con "carne," on BBQ "chicken" pizza, or inside BBQ "pork" spring rolls, to name a few. 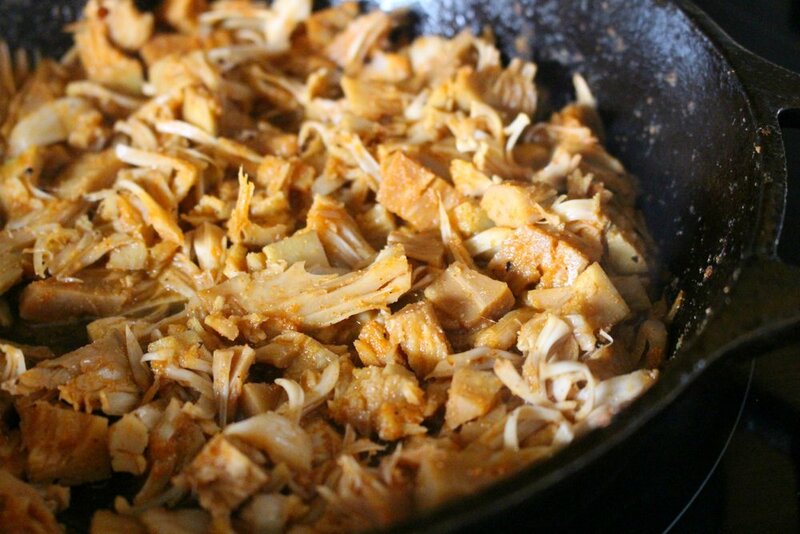 The jackfruit looks like the above photo after you simmer and mash it and combine it with the sauce. If I'm serving it on a sandwich or sliders I will usually stop at this step and just serve it extra saucy. But if I'm using it to top a pizza or nachos or in spring rolls, I like to take the extra step and finish it in the oven to improve the texture a bit, as shown below. Seasoned, stewed jackfruit makes a delicious substitute for pulled pork in sandwiches, on nachos, in spring rolls and more. Drain jackfruit and rinse thoroughly. Add jackfruit, spices and veggie broth to a heavy-bottom skillet and bring to a boil over medium heat. Reduce heat to low and simmer for 15-20 minutes, stirring occasionally, until jackfruit has softened and liquid has mostly cooked off. Remove jackfruit from heat and mash with the back of your spoon or potato masher. Stir in barbecue sauce. Optional: If you want your jackfruit slightly firmer and less saucy, preheat oven to 450°F. Spread jackfruit out evenly on a lined baking tray. Bake for 10-15 minutes, stirring midway, until sauce has dried up and caramelized slightly in places.